The purpose of a turtle filter is to achieve the difficult task of separating turtles from water. Turtles enter through the top but more importantly, they do not exit out the bottom thereby achieving filtration. Seriously though, this is actually a water filter for an aquarium which will house a Red Eared Slider turtle. The tank is 90 Gallons and the turtle is much less, but it's waste will be significant so I need good filtration to keep Mr Turtle (name to be decided) happy and healthy. This type of filter is called a canister filter and must be fully sealed as it will be completely filled with water. A pump will return clean water from the outlet at the bottom back up to the tank against gravity. In doing so, water from the aquarium will be drawn into the top of the filter under vacuum. Because the inlet and outlet will be in equilibrium, the pump should only have to overcome friction due to the filter media and hoses. Gravitational forces should cancel out. 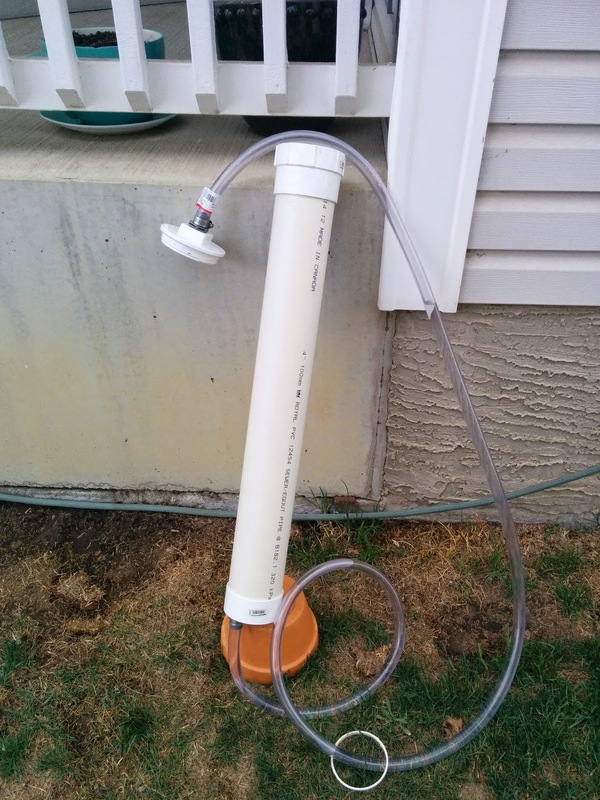 The canister filter is made of 4" (100mm) PVC waste pipe. The top is a plug & cleanout adapter so that the filter can be disassembled and the media removed for cleaning. The bottom is a drain cap which is PVC cemented to the pipe. The bulkheads are watertight electrical conduit fittings made by a company called Carlon under the trademark LiquidTight. They are the sort of fitting used on hot tubs and other outdoor electrical equipment. I think they are intended to house electrical cables and therefore keep the water out but they don't know that and function just nicely as plumbing parts. The filter media will be a mix of mechanical (sponges and filter floss) and biological (ceramic media and bio balls). For anyone wanting to build this style of filter, I found YouTube a wealth of information on this type of construction. My recommendation would be to glue one joint at a time, testing for watertight at every step so that you don't have to throw away loads of material when you make a mistake. When a conversion such as this is done properly, it can last for many years – in fact, some of them have been known to outlast the actual vehicle plumbing services. Anyone who needs further information on performing a conversion can contact us today at OC Plumbing Pros.